We Are Game. 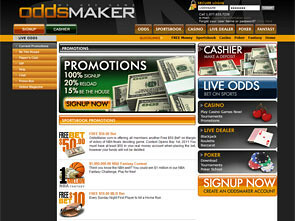 With such a motto, Oddsmaker sportsbook invites you into the world of sports and odds to enjoy online betting at the utmost. This online sportsbook offers you to choose among various promotions available including amazing Sign Up bonus as well as free bet and various fantasy contests. You can choose among such sports to place your bet as basketball, baseball, football, boxing, hockey, golf, mixed martial arts as well as such entertainment odds as American idol and Charlie Sheen props. 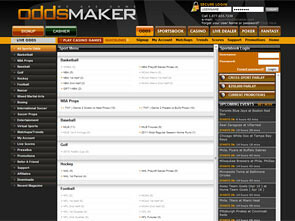 You also can choose live odds to bet enjoying the games in real time. 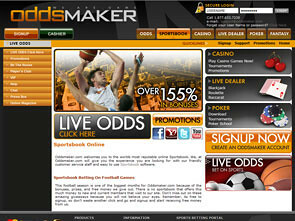 Oddsmaker sportsbook prepares a lot of bonuses for you. First of all, all new players can get 100% up to $1,000 Sign Up bonus. Just make your first deposit and take advantage of free cash to play with. The other promotion you can take advantage of is 20% Reload bonus. The minimum deposit to make to claim this promotion is $50. You can get up to $1,000. This bonus is available for the deposits made on Tuesdays and Thursdays, from 12:00AM ET to 11:59PM ET. You have up to 7 days to claim your bonus. You also can get $50 Free Bet on Margin of victory of NBA finals deciding game. This contest opens May 1st, 2011. All you need is to have at least $50 in your real money account when placing the bet. 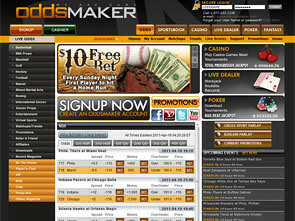 Oddsmaker sportsbook provides you with various promotions to try including Refer a Friend bonus, VIP Loyalty contest and many more others. There is also nice $100 Free Bet to claim and play with. This bonus should be wagered 10 times before any withdrawal is allowed. Visit FAQ page and watch walkthrough tutorials that help you to place your first bet or sign up an account. You will also learn about buy point, parlay, teaser and some other things to know for successful betting online. All the information is presented in user-friendly way to find the things you are interested in easily. You can see the examples to understand the whole process as well as to make a decision what kind of sports to bet on and how to calculate your winnings. You can choose among such payment options as Visa, MasterCard, Money Transfer, Amazing Connect, FedEx, Bank Wire, MyPaylinQ, Cash Transfer and some others. Deposit with such currencies as American Dollar, Canadian Dollar, British Pound or Euro. The minimum withdrawal allowed is $50. The maximum withdrawal is $4,000 per week.